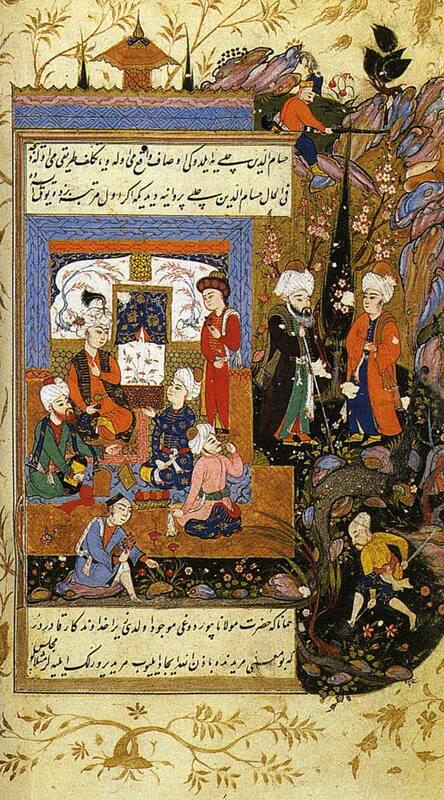 The patronage of the Ottoman Kings attracted a lot of Persian literary figures to Anatolia. Sultan Salim ordered the composition of a new Turkish literary form based on Persian blueprint. The Turkish literature out of this new form was mainly based on Persian poetry and prose. During the second half of 11th century, two historical events made significant impacts on both Christian and Islamic cultures and civilizations. The first, the Battle of Manzikrert in August 1071, was one of the most decisive defeats in Byzantine history. In this battle, the Seljuk sultan Alp Arslan defeated and captured Emperor Romanus Diogenes. The Turkish victory led to the ethnic and religious transformation of Armenia and Anatolia, the establishment of the Seljuk Sultanate of Rum, and later the Ottoman Empire and eventually the Republic of Turkey. The second event was the beginning of the Crusades (circa 1095) when the opposing forces of Islam and Christianity began their battles. The Seljuk and Byzantine clashes before the formation of the Ottoman Empire could be categorized as the continuation of rivalry between the Persian Sassanid and the Byzantine Empire. The primary difference in this case, however, was the indirect involvement of Iranian politicians and scholars. A direct outcome: Persian language and Persian literature both becoming the official language of the governmental bodies. Another significant result of the Manzikrert battle was the spread of regional Turkish Emirates throughout Asia Minor, established by the migrating Turk tribes such as Saltukids, Seljuks of Rum, Daneshmandieh, and Bani Mangu Chak. Even before their dominance in Anatolia, the Seljuks, were in touch with Iranian civilization and culture and accepted Persian as their court language. 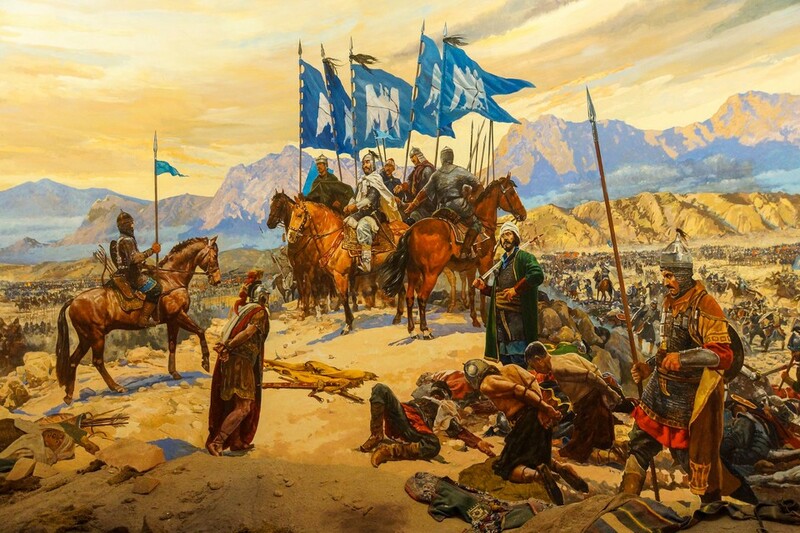 Despite tension and conflict among Turkish tribes, land battles with the Christians, Byzantine Romans, and other regional powers resulted in a net gain of Seljuk territory. However, such continuous conflict eventually limited their rule. By the 13th century, when the Mongol Empire had reached Mesopotamia, the Seljuks were obsequious to the Ilkhanids, making Anatolia a safe refuge for many scholars, writers, poets, and bureaucrats who were forced to leave their home. Mowlana Jalaluddin (1207 – 1272 A.D.), the great mystic poet of Iran, left Balkh on the eve of Mongol invasion to Quniyya in Anatolia. He felt at home in his new place mainly because there; he could also converse in Persian and recite his mystic poetry in Persian where everyone would understand and enjoy. Although various Turkish dialects were in use in the Saljukid domains, the court and literary language of the whole kingdom continued to be Persian. This Iranian poet, Baha’uddin, the son of the famous Mowlana Jalaluddin Rumi composed a poem entitled Rubab-Nameh, in which he included 156 Turkish verses. This composition was the beginning of Turkish literature under Persian inspiration. From the beginning, the Seljuks had submitted to the authority of the Caliphate in Baghdad and followed the Ghaznavids who had accepted the Arabic language as the diplomatic language of their kingdom. Arabic was the language of all reports and correspondence. However, the management and organization of the courts and most critical institutions were handed to the Persians. Two key figures in the early days of the Seljuks, Amidalmulk Kondori (minister) and Abulhassan Albakherzi (chief of staff), were among the Iranians who mastered the Arabic language. Muhammad Bin Omar Alradoyani authored the book “Tarjoman Albelaghe” in Persian. After five centuries of using Arabic as the official government language, this was the first book to use Persian in this capacity. Toward the end of Malek Shah’s reign, his chancellor, Nasir Uddin Tousi changed all court correspondences to Persian. Fortunately, a collection of these documents have been recovered and offer excellent examples of that era’s writing style, while the contents story a series of historical and political events. Gradually, the Persian language regained its status throughout all government and court communications. Except for reports sent to the Caliphate in Baghdad, Persian became the language of the state. This development was mainly due to the rich depth of Persian literature. The Seljuk kings’ fascination with Persian literature was to the extent that some began composing their poetry in Persian – among them: King Sinjar, Muhammad son of Malik Shah, his son Suleiman, and the last of the dynasty, King Tugrik. The Seljuks of Anatolia had more affection toward Persian dialect and Iranian culture. Although the great Seljuks had accepted the Persian language as the court language, they still preferred Arabic names and titles. Anatolia Seljuks began using names of pre-Islamic Persian kings such as Kaykhosro, Kaykavous, Kayghobad, Bahramshah, Faramarz. The peace and security that the Ottoman Empire had established attracted several Iranian families of scholars, writers, poets, and politicians. The completion of Mowlana’s Masnavi Manavi and the formation of the Mevlevi Order not only established the Persian language as the tongue of government but culminated the love and pride of knowing and composing Persian prose and poetry. The spread of the Persian language through Mevlevi shrines made it the dialect of the Sufis. Similar to the Seljuk rulers, the Ottomans promoted and supported the Persian language. 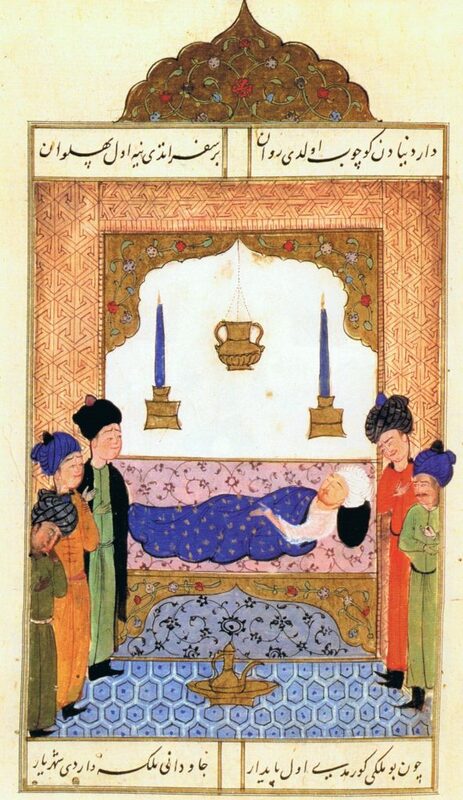 The reborn evolution of the Persian etymology and its impact on the Turks’ literature and culture reached perfection in the Ottoman Royal Court (Divan Edebiyati) and the Sufis’ Khanqahs (Tekke Edebiyati). From the remote domain which they had carved for themselves in the European provinces of Orthodox Christians, the Ottoman “Ghazis of Rum,” still looked to the heart of the “Iranic World”- to quote from Arnold Toynbee, for intellectual light and leading. The Ottoman Sultan Bayezid II (1448- 1512), who was the father of Salim I and the son of Mehmet the Conqueror, was in correspondence with the divines and the men of letters of Khorasan, including the poet Jami. 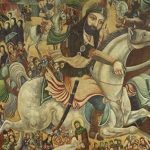 Before Shah Ismail the founder of Safavid dynasty consolidated his power, Iran was the real literary and cultural center through which the Seljuks, Ottomans, Transoxiana’s, and the Indian Muslims drew their inspiration and power. In this vast area, the people had discarded Arabic for Persian as its secular literary vehicle. Most of these territories were somehow a colonial extension of the Persian world, and the representatives of the Iranian society in these areas. Like its representatives in Hindustan depended on for the maintenance of their culture upon a steady flow of arts and ideas, and of immigrants to import them from the homelands of the Persian civilization. The last of these immigrant treasures were a group of families of skilled indigenous artisans whom the Ottoman Sultan Salim brought home with him from Tabriz in 1514. Then, there ensued a contest between Iran’s Shah Ismail and the Ottoman Sultan Salim on the question of who should be the political and military leader of the region, including Iran. Sultan Salim wanted to be the Caliph of Islam throughout the Islamic world. The Sultan’s goal was contrary to the wishes of Shah Ismail who also had a similar plan in a different direction. Shah Isma’ili’s objective was to reduce the religious dualism of the Islamic world to unity by imposing the minority’s religion- Shia upon the majority by sheer military force, but this proved to be beyond his powers. Despite the vigorous efforts of both sides, in the end, Shias remained the minority and Sunnis maintained their majority status. 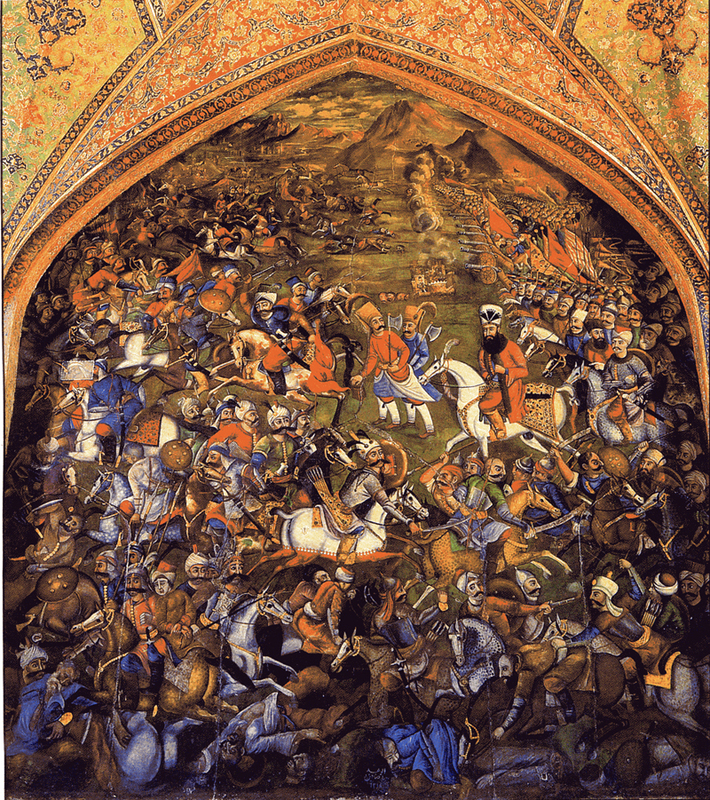 In his thorough review of the Persian literature, Professor Edward Brown relates the degradation of Iranian literature and poetry during the Safavid period to the Safavid kings’ intense antagonism toward Ottoman Empire and their devotion to Shia doctrine and encouragement of the study of its principles and laws. Although this policy resulted in the unification of the country to this date, opposed the mysticism of Persian poetry and thinking that were not in line with harsh interpretations of the Court. This aspect of the policy could have contributed to the migration of Persian literary figures to Anatolia. However, the Ottomans did not completely break ties with Persian literature. Jami’s works considerably influenced the Turkish literature for a century. In the 16th century, the style and work of Iranian poet Urfi became an ideal in Turkish poetry. Like their Seljuk predecessors, Sultan Salim and some other Ottoman kings and royalties including, Sultan Bayezid I, Sultan Mehmet the Conqueror, Sultan Bayezid II, and Sultan Suleiman the Magnificent (Qanoni- Lawgiver) composed their poetry in Persian. When Wilhelm II, German Kaiser, wished to impress Sultan Abdul-Hamid, the last Ottoman Emperor, he ordered the Diwan of Persian Verses of Sultan Salim to be printed on the best paper in Berlin and offered it to him. Up until early 20th century, the study of Persian language was compulsory in all Turkish schools and most of the high dignitaries of Ottoman Court used to recite Persian verses of Hafiz and Sa’adi and other great poets of Iran and considered it as a sign of cultural refinement. Most of the Ottoman Sultans including Sultan Abdul-Hamid used to consult Hafiz’s Divan before taking important decisions. Central and Southern lands of Europe – especially Spain, were conquered by the Muslims in the early 8th century. Although this victory put its cultural marks on Spain, due to internal conflicts and battles among Muslims, these artifacts were eventually forced out. Around the same time, the Seljuks, who had defeated the Byzantine empire, gained new territories in Asia Minor and Eastern Europe. The Manzikrert Battle of 1071 gained vast territories in Anatolia. Three centuries later, the Ottomans conquered Albania on the southwestern part of the Balkans. By the end of the 14th century, Adrianople, Ishkodra, Bosnia, Hercegovina, Macedonia, Kosovo, and Sirbsindighi, were all lands captured by the Turks. During the mid-15th century, Bogomils of Bosnia and Hercegovina converted to Islam and submitted to the social and cultural conventions of the Ottomans. In Albania and some other regions, feudal, landowners, and the wealthy were first to convert to Islam. Perhaps the motivation was to prevent the forfeiture of their possessions, as Muslims were exempted from paying taxes and government fees. Islamic schools were founded in all these regions. Persian was adopted as the language of literature and philosophy and developed as an integral part of the curriculum in most of these schools. In addition to schools, Khanqahs were also instrumental in advancing the imprint of the Persian language. 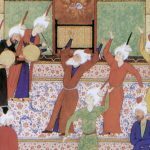 Khanqahs’ and Sufi societies and gatherings considered Persian as the appropriate language for the texts of Attar Nishapuri, Saedi’s Golestan and Boostan, Hafiz, and Masnavi. In general, the Dervishes of the Mevlevi Order, Bektashi Order, and Khawati Order played a very pivotal role in the promotion and popularity of the Persian language. In the Northern part of the Balkans, under the Ottoman rule, Persian did not become the language of poetic and philosophical writings, but it expanded and found another path of livelihood, through a peaked interest in Iranian studies. Persian also became the language of Albanian poets and writers who aspired for freedom and independence. The elite and influential class of the Albanians, who themselves had Persian education, supported and promoted these writers. 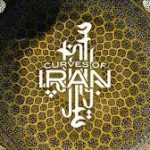 The Iranian cultural heritage that had passed from the Ghaznavid Turks to the Seljuk Turks; and from them to the Ottomans, found its way to Europe. Turks carried Iranian culture and literature to Europe. One notices many Persian words in the vocabulary of countries in Eastern Europe. The Rumanians still today call an enemy dushman, the curtain is pardeh; minced meat is Kufteh. We find the following slightly altered Persian words in the Bosnian language: adigar, aferim, agush, aya, ayna, armagan, ashicare, avaz, bashca, bashowan, bazarjani, bazuvent, behar, behut. 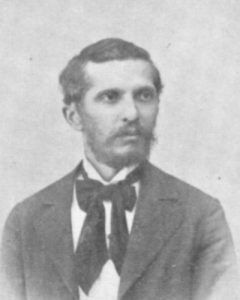 Naim Frasheri (1846-1900), was the last of Balkan poets who had poems in Persian. His teacher was a Bektashi scholar who thought him Quran, Principles of Science, Turkish and Persian. At age 19 along with his brother they left for Yania, and continued higher education at a Greek school. His older brother Abdullah Frasheri was one of Albania’s politicians and independence fighters against the Ottoman rule. Naim became one of the key literary figures of Albania. He had a clear understanding of his people’s history and cultural background and chose to compose his poetry and prose in a common language. He remained loyal to Bektashi Order. In his Persian compositions, he was under the influence of great Persian poets; Attar Nishapuri, Molavi, and Saedi. (see some of Naim Frasheri’s Persian poets in the Persian section of Hamsayegan). Sunni - Shia Divide in Plain Language! Asghar Khamseh Documents "Fire of Hatred"
Sunni – Shia Divide in Plain Language!